ST. PETERSBURG, Russia (AP) — It's not yet clear what role Kevin De Bruyne will play for Belgium in the World Cup semifinal against France. That's because coach Roberto Martinez believes the Manchester City midfielder is such a talented footballer, he could start virtually anywhere on the field and he'd excel. "It's essential to have a player like Kevin — that he can play different roles," Martinez said Monday, on the eve of the semifinal. "Apart from goalkeeper I could tell you that he could not just play, he could perform at the highest level in any position. That's the quality that he has." And that makes it easier for Martinez to switch tactics — which he's frequently prone to do — as he attempts to both create chances for his attacking lineup and stifle the threat of speedy France forwards Kylian Mbappe and Antoine Griezmann. Belgium is tournament's top scorer so far with 14 goals. France has nine. De Bruyne had a relatively quiet start to the tournament — by his high standards — playing a deeper and more defensive role than he occupies in Manchester. But the 27-year-old burst onto center stage in knockout matches as Martinez pushed him into a more attacking position. First, his surging run helped set up Nacer Chadli's late winner in the come-from-behind 3-2 defeat of Japan. Then he scored the decisive goal in Belgium's 2-1 victory over Brazil in the quarterfinals with a searing, low shot into the far corner of the net from the edge of the penalty area. "When he plays in that forward role, when he plays a bit more in the final third his play, his performance, is very, very attractive and maybe then it gets a bigger recognition," Martinez said. It is the kind of incisive play he displayed all season as Manchester City marched to the English Premier League title. De Bruyne just missed out on end-of-season honors from the players' association and football writers association because of Liverpool and Egypt striker Mohamed Salah's goal glut. In a Belgium team packed with so much talent that it's known as the Golden Generation, De Bruyne is one of the standouts along with striker Romelu Lukaku and Eden Hazard. Whether he plays an attacking role or more defensively, De Bruyne is instrumental in directing Belgium with his awareness and swift passes. "Kevin De Bruyne is a modern playmaker in the fact that he goes even quicker than what you can see," Martinez said. "His level of execution is exceptional." 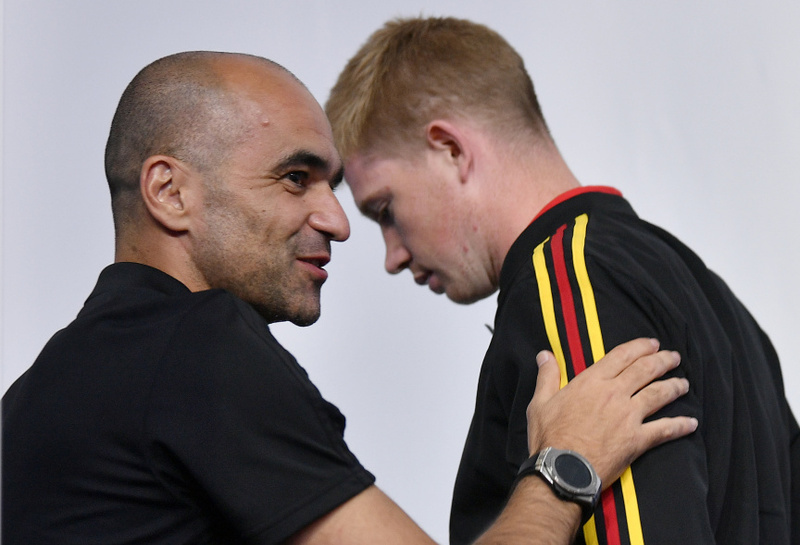 Martinez is not the first Belgium coach to be bowled over by De Bruyne. "He played man-to-man against Kolarov and devoured him, defensively and offensively," Wilmots told The Associated Press in an interview before the World Cup. "He's a player with high quality runs, a big motor, but also quality crosses and assists." De Bruyne says that wherever he plays, his mindset remains essentially the same. "My role for the team is to create opportunities and to give passes that my forward teammates can use to make the difference," he said. France will have to be at its best to shut him down. "When he has the ball, he sees things faster than anyone, and lights the game up in a quite incredible way," Wilmots said.